Raw (Julia Ducournau, 2016) - Justine (Garance Marillier) comes from a long line of vegetartians and vets. However, following a horrific hazing at veterinary school, she soon encounters a decadent, merciless and dangerously seductive world. 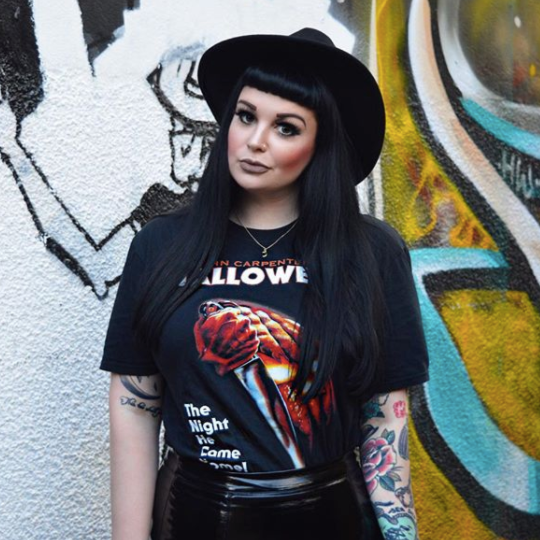 Desperate to be accepted by her peers, she strays from her principles and eats raw meat but quickly experiences unexpected consequences as her true self begins to emerge. Arguably one of the most underrated films of 2017 is French-Belgian horror, Raw. Told from a refreshing and unique female perspective, Raw does a fantastic job exploring the monstrous and taboo subject matter. Whilst the majority of audiences will find themselves shocked and appalled by many of it's scenes, cinephiles will find themselves utterly exhilarated. 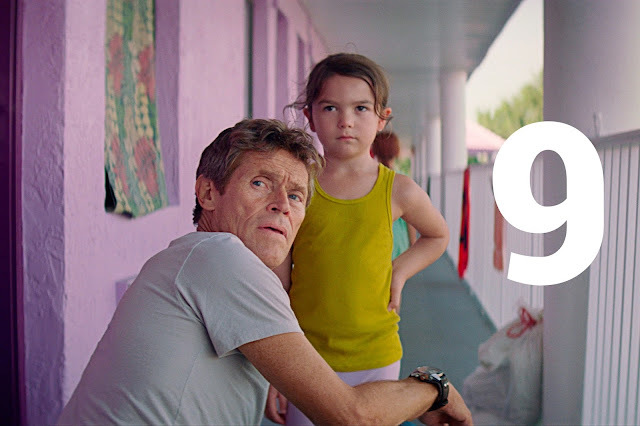 The Florida Project (Sean Baker, 2017) - Set on a stretch of highway just outside Disney World, The Florida Project is told through the eyes of six-year-old Moonee (Brooklynn Prince) and her rebellious mother Halley (Bria Vinai) over the course of a single summer. Living at The Magic Castle motel (run by Bobby, played by Willem Defo), Moonee spends each day causing mischief and adventure but is unaware of the means her mother goes to support their living arrangements. I had no idea what to expect when going in to The Florida Project but within minutes I knew it was a winner. Whilst there may not be a clear plot as such, the film is very much an observational piece on Trump's America. Shining a harsh light on poverty and working classes in Florida but through a beautiful and moving lens. 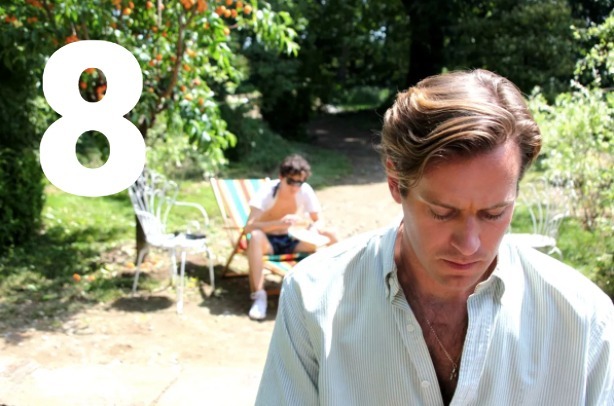 Another emotional entry in at no.8 is Call Me By Your Name. Having so rightfully received praise at the London Film Festival, the film is a full-hearted romantic masterpiece. Strap yourself in for a rollercoaster of joy and devastation. 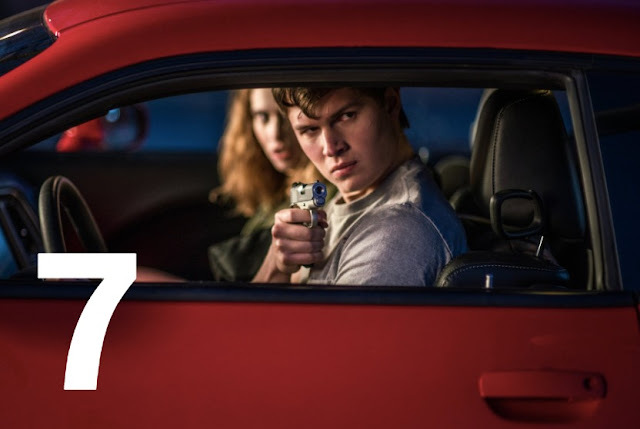 Baby Driver (Edgar Wright, 2017) - Baby (Ansel Elgort) decides to leave his life of crime behind when he meets the love of his life, Debora (Lily James). However, being the best in the business causes problems for Baby when his crime lord boss, Doc (Kevin Spacey), won't let go without a fight and insists on one last heist. Baby Driver is easily one of the most enjoyable and original films I've seen in a long time. The direction is flawless; the cast (both supporting and leads) make for fantastic viewing and the soundtrack will leave you buzzing. This highly amusing and sometimes heartwarming action thriller was an easy entry for my top films of 2017. You can see my full review here. Star Wars: The Last Jedi (Rian Johnson, 2017) - Having been sent by the Resistance to find Jedi Master, Luke Skywalker (Mark Hamill), Rey (Daisy Ridley) is determined to learn the ways of the Force. Meanwhile, Finn (John Boyega) must find a way to save the ship from Kylo Ren as the First Order carry out an assault on the Rebel fleet and Princess Leia (Carrie Fisher). Whilst the latest Star Wars instalment has left critics and fans divided, I can honestly say that I just loved it. Of course, not without fault, it is steeped in nostalgia whilst also welcoming a new generation. 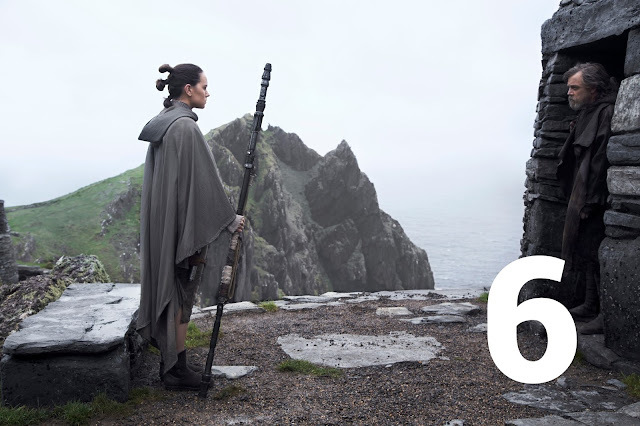 To be expected from Disney and Star Wars, it does not fail to shock and awe as it combines humour, stunning cinematography and superb storytelling. 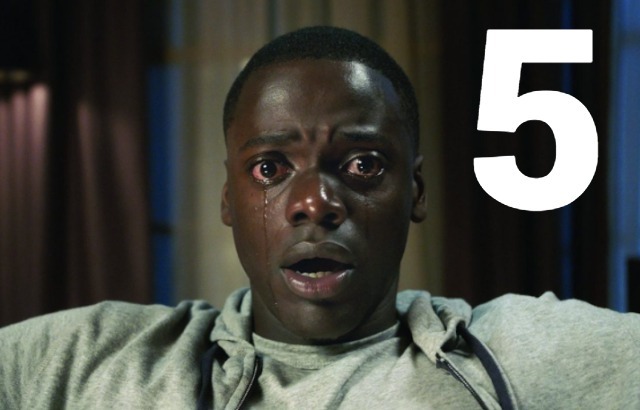 A tense and intelligent satire from start to finish, Get Out very quickly made it in to my Top Films of the year list. With very little flaws to be found and so many wonderful Easter eggs dotted throughout, it is so easy to forget that this is Jordan Peele’s directorial debut (and first film away from his comedy partner, Keegan-Michael Key). Here’s hoping that this is the first of many - read my full film review here. Gangs of New York (2002) director, Kenneth Lonergan, returns to the chair for the first time since 2011. Though an utterly depressing narrative, Manchester By The Sea features some truly mesmerising performances; including that of Affleck who took home the Oscar for Best Actor and a nomination for Best Supporting for Michelle Williams and Lucas Hedges. For me, Manchester By The Sea just ticked all the boxes. I'll admit I was rather apprehensive when I heard they were making a Blade Runner sequel. As one of my all time favourite films, I felt as though it was entirely unnecessary and could only tarnish the reputation of a wonderful classic. However, under the trusty supervision of Prisoners (2013) and Arrival director, Denis Villeneuve, it is a truly remarkable piece of cinema. In true Villeneuve style, it has outstanding cinematography and is a masterpiece in storytelling. A 5 star film. 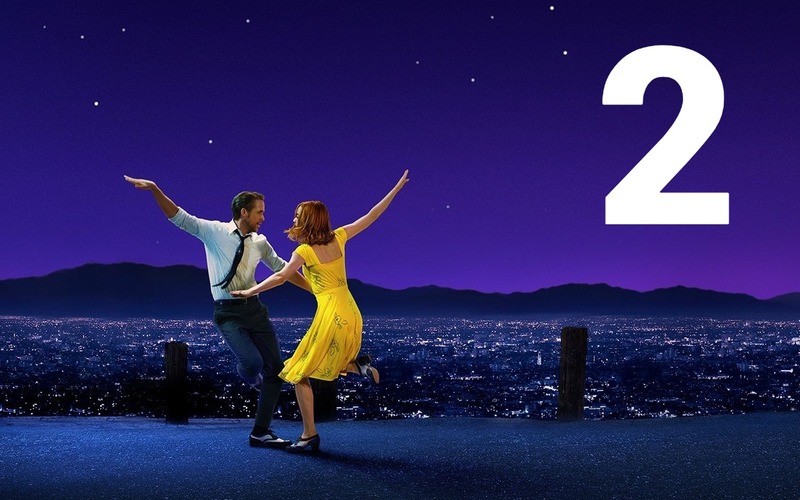 La La Land (Damien Chazelle, 2016) - Set in present day Los Angeles, follows the story of Mia (Emma Stone), an aspiring but struggling young actress. Having met Sebastian (Ryan Gosling), a dedicated yet conflicted jazz musician, the pair set out to pursue their dreams in a city where not everyone can make it. Presented as an all singing, all dancing musical, the pair must choose between a lifetime love or the glowing spotlight. Having famously missed out to Moonlight at the 89th Academy Awards, La La Land still managed to dominate awards season. Written and directed by Damien Chazelle of Whiplash (2013) fame, we can experience a rollercoaster of emotions; beautiful cinematography and engaging performances from both Stone and Gosling. It may have received mixed reviews from audiences but it's safe to say that, for me, La La Land is a modern day classic. I haven't been able to stop singing the soundtrack since. With Kenneth Branagh, Tom Hardy and Cillian Murphy starring, and Christopher Nolan in the director's chair, it was hardly any surprise that Dunkirk was set for greatest. I managed to see Dunkirk three times during it's cinema run, each time leaving me just has emotional and in awe as the first. 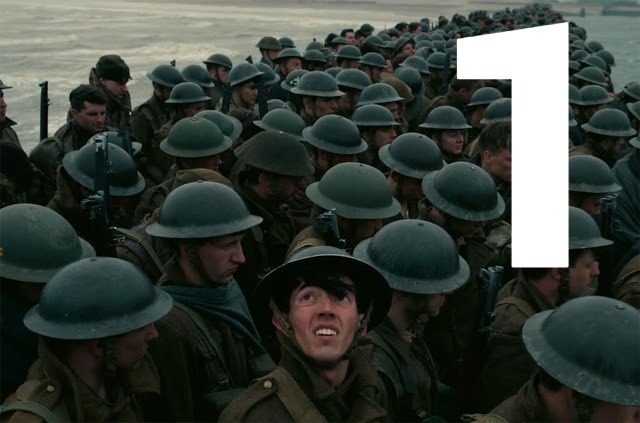 Arguably one of the most intense films ever made and perhaps one of the all time best of its genre, Nolan's Dunkirk is a remarkable and stunning lesson in history and the human condition. You can read my full review here. Well, that's it for my Top 10 Films of 2017. I can assure you this was no easy list to make. There were so many films this year that would have just as deservingly been included. Some honourable mentions from my Top 20 would include Brigsby Bear (Dave McCary, 2017), Moonlight (Barry Jenkins, 2016), Wonder Woman (Patty Jenkins, 2017), IT (Andy Muschietti, 2017) and Guardians of the Galaxy Vol.2 (James Gunn, 2017). 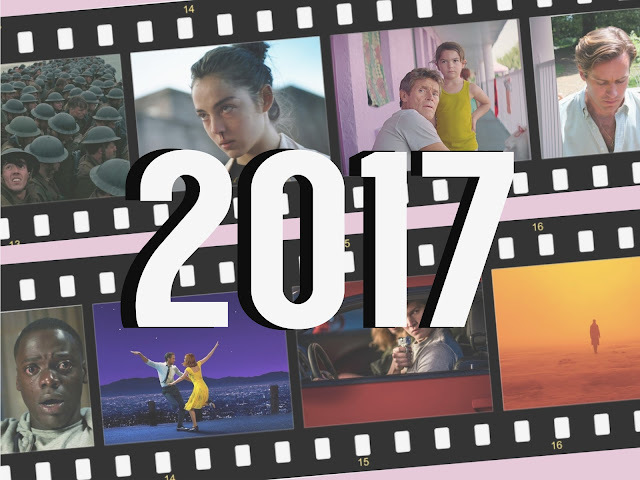 But tell me, what were your favourite films from 2017? Were there any you think I've missed out? As always, I love reading your comments so please do leave me lots of lovely ones down below. Until next time, have a fantastic New Year film fans! I haven't seen your 8 and 9 so I'm glad you mentioned them so I can put them on my list to see eventually. Raw, a French language film, is a very interesting and good choice. I've never seen a scene in a movie that depicts fighting between two women in such a unique way. There is a fight in real life between Holyfield and Tyson that only approaches it. Oh, I enjoyed a lot of The Last Jedi but there are some things that I didn't like. I rate The Force Awakens much higher and would put that on 2015's top ten. TFA set up a lot of mysteries that I feel were simply thrown out by TLJ. This mainly has to do with Kylo Ren. He commits this horrendous act in TFA but I don't think we get an adequate explanation of why he does it (beyond some lines in TFA between Leia and Han). I feel they needed to justify certain parts of Luke and Kylo's behavior much better than they did. I didn't care much about the first two prequels but I feel Revenge of the Sith did a good job showing Anakin as a naive character who is manipulated into performing evil acts and led to the dark side. That has not happened with Kylo. But I did love seeing Luke and Leia again as well as the newer characters. One I haven't seen but would very much like to see (maybe this weekend?) is The Shape of Water by Guillermo del Toro. I really like Sally Hawkins (also Octavia Spencer and Michael Shannon). I remember that you said you really loved Richard Ayoade's Submarine and she was very good as the mother in that one. How do you rate Shape of Water? I really liked Blade Runner 2049. I feel this was the best film in the sci-fi genre of 2017. I don't know why it did poorly at the box office. And the women in that film are strong! Look at the performances by Ana de Armas, Robin Wright, and Sylvia Hoeks (also Mackenzie Davis). Okay, it doesn't pass the Bechdel test but what exactly are Robin Wright and Sylvia Hoeks going to talk about in the pivotal scene they have together beyond what they did talk about? I thought Logan was a great closing chapter for the Wolverine character so I would put that on my list. Overall, those are fine choices on your list, Sophie! Yes I think Force Awakens is the stronger film but I still really enjoyed the Last Jedi. I've seen it 3 times now and I liked finding new details in it each time. I think the reasons why Kylo Ren killed Han Solo is quite clear personally - it's necessary so he can truly turn to the Dark Side but Rey is keeping that tiny bit of Light alive in him. He also did it to prove himself to Snoke. The prequels are pretty terrible tbh, which is a shame. I rewatched them recently and they're very badly done and so cheesy - made to look even worse by how good Force Awakens and Last Jedi are. The Shape of Water isn't out in the UK until February 14th but I think I'm going to a press screening of it next week so fingers crossed. I have very high hopes for it and love the cast. The original Blade Runner had the exact same problem whereby it bombed at the Box Office but went on to be considered one of the greatest movies ever made. 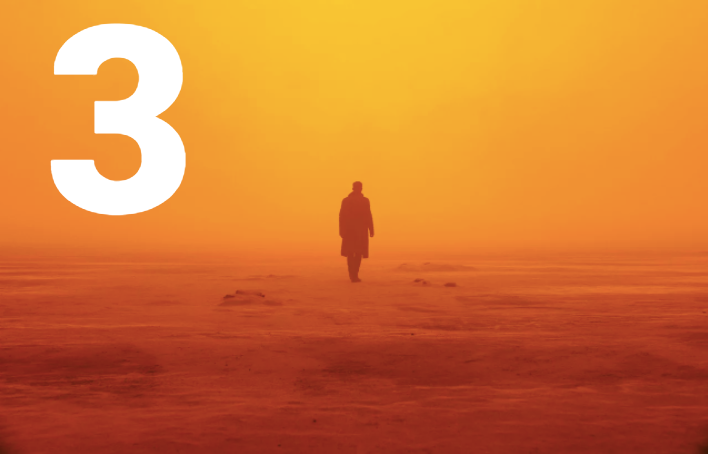 I thought 2049 was just flawless, I loved it. I think my attachment to Greek myth and tragedy where the murder of a family member is the most serious and heart-wrenching crime is why I don't accept as convincing the notion of Kylo Ren committing the murder to prove himself to Snoke or to prove to himself that he has fully embraced the Dark Side even though I believe you are correct in that is what the writers intended. Thank you so much for recommending Three Billboards Outside Ebbing Missouri which was an excellent film! The characters do some extreme things in that movie but I feel I understand their motivations pretty clearly. The same for Lady Bird where I think Laurie Metcalf should get an Oscar nom. Oh, I saw The Shape of Water and I loved it! Sally Hawkins is such a wonderful actress and she should get an Oscar nom for Best Actress! There were many great performances, including by Richard Jenkins playing her neighbor :) I believe this film will meet your expectations as I think this film is Guillermo del Toro's best film since Pan's Labyrinth. There is just one scene that I found disturbing and unnecessary and you'll know what I'm talking about when you see it next week. Re the Golden Globes, Frances McDormand and Sally Hawkins did wonderful jobs in their respective roles. But imo, Sally Hawkins's performance was stronger because it showed more range. She's the one I'll be rooting for come Oscar time. Anyway, I hope you had a great weekend, Sophie!